Members of the Savannah Youth Council on Thursday with Gov. Nathan Deal, Sen. Lester Jackson, Mayor Pro Tem Van Johnson and Savannah Acting City Manager Stephanie Cutter. 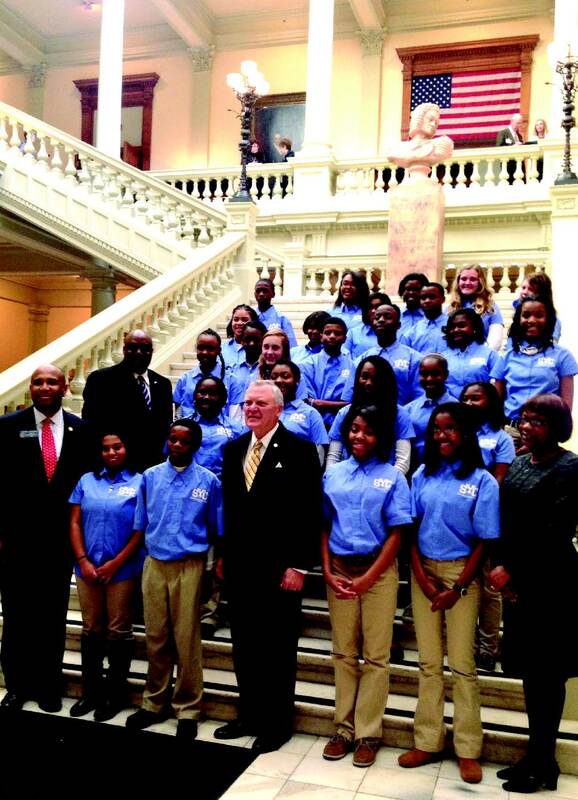 Members of the City of Savannah Youth Council traveled to Atlanta today to meet with Gov. Nathan Deal, as well as State and local legislators as part of Savannah-Chatham Day. The Youth Council members spent part of the day beneath the Gold Dome, where they discussed youth issues with elected officials and watched lawmaking in action. The Savannah Youth Council is organized by the City of Savannah, and is comprised of more than three dozen local eighth-graders. Over the course of a year, they receive leadership training, volunteer community service, and learn the ins and outs of City Government.